Scroll down to place your order and take advantage of this special offer. You can also order several Mastery DVDs and save even more. The Artistic Composition Mastery Workshop on DVD is similar to attending my 2 day Artistic Composition Mastery Seminar except that you don't need to travel and you can study the materials anywhere, as many times and you want at your own pace. in the Mastery Workshops on DVD/USB series. A few years ago I published the Technical Composition Mastery Workshop on DVD. A lot of things have changed since this tutorial was published. In short, Fine Art Photography has moved forward. A lot of things are possible now that were not possible then. Furthermore, the competition among photographers trying to be noticed has never been more fierce. While the number of photographers who were creating fine art digital photographs back then was relatively small, today there are innumerable photographers all trying to be noticed and their ranks are increasing in numbers every single day. How do you stand out in these conditions? What do you have to do to create work that rises above the masses and that stands out as unique, interesting and personal? I addressed this important question in my previous Mastery Workshop on DVD: The Vision Mastery Workshop. The answers I gave are important and useful but they are theoretical in nature, as is appropriate when talking about vision. The goal being to help you define your vision and make decisions about the direction you want to give to your work. I continue this journey now with the Artistic Composition Mastery DVD but with a practical rather than a theoretical approach. In a way the Artistic Composition Workshop is the practical application of the subjects I teach in the Vision Mastery Workshop. As its name implies, the Artistic Composition Mastery Workshop on DVD focuses on the subject of Artistic composition. It is the continuation of the Technical composition mastery workshop on DVD. If you have not studied the Technical Composition DVD I recommend you do so in addition to the Artistic Composition DVD. The two can be studied in any order. You can start with one or the other. Composition is an important subject in art and specifically in photography. It is at the root of learning how to create great photographs, of improving your images, of developing a personal style, or learning how to see artistically and reaching the next step with your work. In this mastery workshop on DVD we look at a wide variety of ways we can approach composition from an artistic perspective. We also study a large number of examples to learn how this is done. As you work your way through the many tutorials on this Mastery DVD, keep in mind that this is an artistic process. To this end I have decided to focus on live examples rather than on text-based instruction. While text based instruction is featured in this Mastery DVD, photographic examples are privileged. The goal of creative artistic composition is to show your audience something that they have never seen before. To do so artists and photographers need to tell a whole story in just one frame. The goal of the Artistic Composition Mastery Workshop on DVD is to teach you hundreds of ways to compose your photographs creatively and therefore to tell your story. To teach you how to do so, and to give you a creative advantage, a competitive edge, we will explore new ways of composing images. Of course you only need to use one or two concepts in each image, however having the freedom to choose between many different concepts gives you an unparalleled amount of creative freedom. - Don’t become someone else because this ‘someone else’ is respected, known, famous or just ‘good’. Instead give yourself the permission to be yourself. - The unknown is where what has never been done is located, so don't be frightened by the unknown otherwise you will never create anything new. - We learn by making mistakes so don’t be afraid to make mistakes. - Learn the concepts of composition, not the rules, and once learned don’t hesitate to disregard them if they contradict your artistic inspiration. - If you sell your work, salability and personal vision are not an automatic match. In fact they clash more often than they match. If your goal is to express your vision, make vision, not salability, your primary goal. To do so experiment and take chances in order to create images that reflect your vision instead of creating images that are commercially acceptable. The goal of the Artistic Composition Mastery Workshop on DVD is to help you develop your artistic skills so that you can learn to see artistically. It contains all the knowledge of composition that I have acquired over the years, from my studies of painting and drawing at the Beaux Arts in Paris, to my study of photography first in Paris then afterwards in the United States. To complement this knowledge I have done additional research on the subject of Artistic Composition for the past two years. The goal of this research was to find out specific aspects of Artistic Composition that are not usually taught. All this knowledge is featured in the 31 separate sections and hundreds of sub-sections of the Artistic Mastery Workshop on DVD/USB. 1 - You get over 150 eBooks in pdf format for a total of over 2000 pages teaching you how to develop your Artistic Composition skills. These include several hundred examples to demonstrate the different types of compositions. These are organized by concepts. There are 27 different composition concepts each featuring a large number of examples. 2 - You get over 40 hours of audio and video recordings in which I explain the process of developing a personal approach to Artistic Composition, how to learn how to see, and all the other aspects of studying Artistic Composition (30 sections in all with multiple sub-sections). The audio, ebooks, video, written and other materials featured on the DVD are carefully organized in a step by step fashion to make study easy. You can complete each step at your leisure and move around from step to step as you please. You can also return to a previous step, or move to a later step, at your leisure. 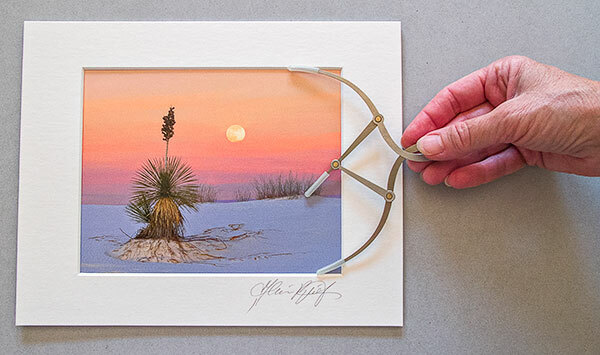 A matted and signed Fine Art Companion Print of White Sands Moonrise, one of my favorite images, is included in the Artistic Composition Mastery Workshop on DVD package. The value of this print if purchased separately is $295. This Companion Print is printed, mounted, matted and packaged in the exact same museum presentation as my larger prints. This print was selected for the Artistic Composition Workshop because it is composed, in part, according to the Golden Ratio. I include it in this package so you can compare the image quality on screen to that of the actual print. This is necessary because nothing is as beautiful as an actual Fine Art Print. Everything else is a reproduction. This collectible print will also be an addition to your Fine Art collection. This photograph demonstrates my personal vision. Why it demonstrates my vision is explained in a detailed presentation featured on the DVD. 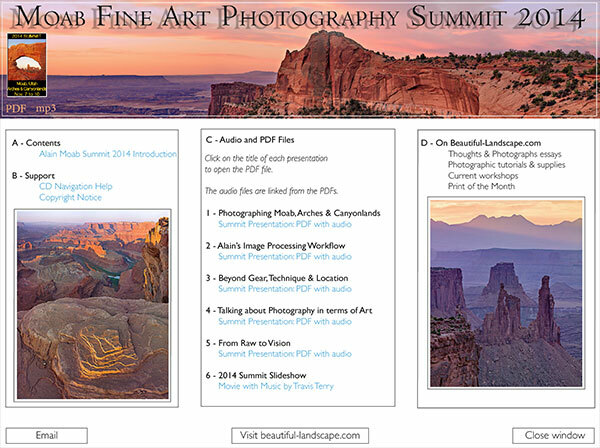 This CD features the recording of the presentations I gave at the 2014 Moab, Arches and Canyonlands Fine Art Photography Summit. There are 4 presentations, each one hour long. The handouts that Summit Participants received during the Summit are also included. Listening to these presentations is like being at the summit plus you can listen to them as often as you want, at anytime and anywhere you like. The CD features mp3 files and will play in any CD player. You can also download the mp3 files to any digital audio device (iPod, iPad, mp3 player, phone, etc.). 5 - You receive the Golden Ratio Compass, in its custom case, to help you compose your photographs according to the Golden Ratio Proportions. The Golden Ratio is one of the 27 concepts taught in the Artistic Composition Mastery workshop. I use it in my work and I show you how to use it in your work. The Golden Ratio Compass is indispensable in order to calculate the Golden Ratio Proportions quickly and effectively on a photograph, either on screen or on paper. As with all Mastery Workshops on DVD, a free Owners Update Area website is available for the Artistic Composition Mastery Workshop on DVD. The link and registration for this site will be emailed to you when you order the DVD. Updates are posted when new essays, tutorials, information, etc are added to the DVD and when new materials are added to the updates area. 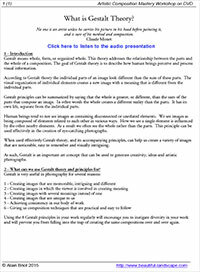 In this site, you also are invited to ask questions related to the materials on the Artistic Composition Mastery Workshop on DVD. Answers to your questions are posted on the Artistic Composition Mastery DVD updates page. You can also read answers to questions asked by other DVD owners. This provides a rich learning environment where owners can share questions and answers with each other. Access to the Mastery DVD Updates Website is free for as long as you own the DVD. which ships with the Artistic Composition Mastery Workshop on DVD. 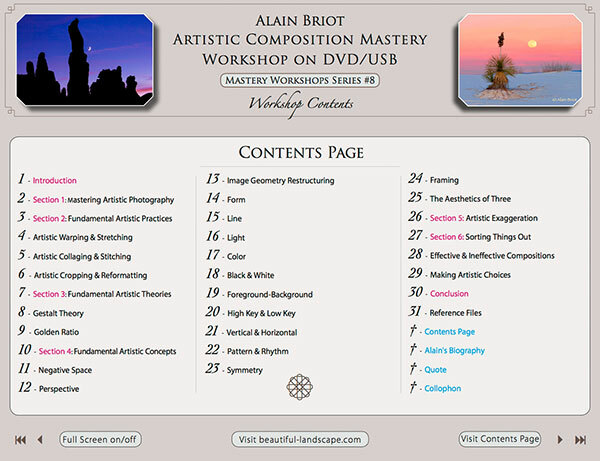 The Artistic Composition Mastery Workshop on DVD/USB features the exact same knowledge as my two day Artistic Composition Mastery Seminar. To be fair to Seminar Participants, the Artistic Composition Mastery Workshop on DVD is priced similarly to the Artistic Composition Seminar. However, there are advantages to studying with the Artistic Composition Mastery Workshop on DVD instead of coming to the Seminar. First, you do not need to travel and therefore you save on travel expenses, lodging, car rental and other incidental expenses. Second, you can study the material at your own pace instead of having to absorb this immense amount of material in just two days. Third, you can study anywhere and anytime you like, instead of having to fit the seminar in your schedule. Finally, you can refer to the DVD later on, as often as you want, instead of referring to brief seminar notes, or trying to remember everything what was said. An entire Master Class on Artistic Composition with hundreds of Movie, Audio,eBooks, reference files, Master Files, Templates and tutorial recordings. Choose any of the 8 Mastery Workshops on DVD. Regular price $975. Special Offer Price: only $795. Shipping is free, worldwide. -> You save $200 compared to ordering each DVD individually at regular price! Regular price $1990. Special Offer Price: $1490 only. Shipping is free, worldwide. -> You save $500 compared to ordering each DVD individually at regular price! Regular price $2985. Special Offer Price: $2135 only. Shipping is free, worldwide. -> You save $850 compared to ordering each DVD individually at regular price! Regular price $3980. Special Offer Price: only $2780. Shipping is free, worldwide. -> You save $1200 compared to ordering each DVD individually at regular price! Regular price $4975. Special Offer Price: only $3325. Shipping is free, worldwide. -> You save $1650 compared to ordering each DVD individually at regular price! Regular price $5970. Special Offer Price: only $3870. Shipping is free, worldwide. -> You save $2100 compared to ordering each DVD individually at regular price! Regular price $6995. Special Offer Price: only $4340. Shipping is free, worldwide. -> You save $2655 compared to ordering each DVD individually at regular price! -> This is our "big kahuna" -- and best ever -- special offer ! Regular price $7960. Special Offer Price: only $4760. Shipping is free, worldwide. -> You save $3200 compared to ordering each DVD individually at regular price! 2 - Over 150 eBooks for a total of over 2000 pages of content in pdf format to teach you how to develop your artistic composition skills. 3 - Hundreds of examples photographs to illustrate each of the 27 different artistic composition concepts. 4 - The Golden Ratio Compass and custom case to help you compose your photographs according to the Golden Ratio proportions. 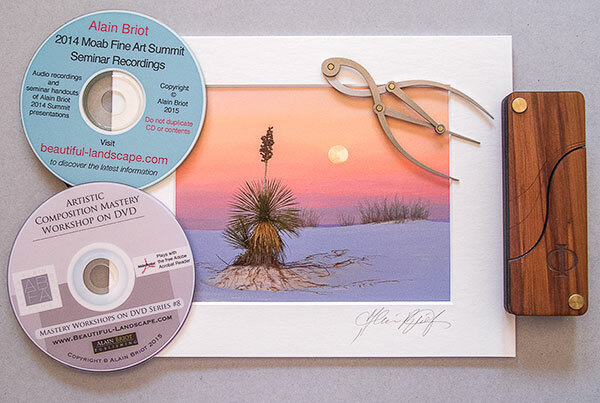 If you do not have a CD/DVD reader in your computer, or if you prefer USB flash cards to DVD, we can ship the Artistic Composition Mastery Workshop and the Summit Presentations on a USB Flash Card instead of on DVD. If you want to take advantage of this option, simply place your order using the link above, then email us at alain@beautiful-landscape.com to let us know that you want your order delivered on a USB Flash Card rather than on CD and DVD. The cost is the same. We offer the option of paying for your Mastery Workshop(s) in 3 equal installments instead of all at once. The three installments will be placed on your credit card a month apart. The first installment will be applied the day you place your order, the second one a month later and the third two months later. To take advantage of this option simply email alain@beautiful-landscape.com or call us with your credit card, phone number and shipping information. There is no extra cost for this option and your order will ship immediately. If you order several DVDs at once we can also work out a longer payment plan. Just call or email us to discuss this option. Not sure if this DVD is for you?